My Tomato Was Transplanted to a Small size Pot, were Some Eggplants didnt Germinated after a month, well actually I Gave Up on The Eggplants after a month so I Put The Bit Grown Tomato Plant in the Middle, and the Eggplants decided to Show Up, would this be a Problem to the Tomato Plant as it Gets Big? I believe the Tomato plant is a Earl Girl I don't Remember the eggplant name. Can Tomato and Eggplants live together or is this just too small for them or is it fine? IMO, the pot is too small for the tomato plant alone, and certainly too small if you add in eggplants. The tomato plant will do best in a container of at least 5-gallon size. I don't know what size an eggplant needs, as I've never grown them. The eggplant varieties I've grown were about the same size as my sweet pepper plants--about three or four feet tall. I'd move the eggplants to individual pots as soon as they are big enough to be transplanted. Did your seeds have bottom heat? Tomatoes and eggplants are warm weather crops and like the soil for seed germination to be 75 degrees F. For me they usually germinate in a week or less at that temperature. Cooler slows them way down - which risks having the seeds rot out in the meantime. I started some black cherry tomatoes by seed the 1st week of September. I got a sprout and the plant as of now is about a foot tall with 2 flower clusters. It is growing really slow and the tomatoes forming are really slow growing too. And I am not sure it will get any taller. This cooler weather definitely slows it down. Anyone know the temp Tomatoes go dormant? Or do they not go dormant? 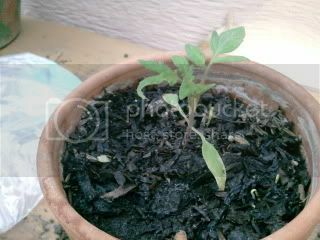 PunkRotten wrote: I started some black cherry tomatoes by seed the 1st week of September. I got a sprout and the plant as of now is about a foot tall with 2 flower clusters. It is growing really slow and the tomatoes forming are really slow growing too. And I am not sure it will get any taller. This cooler weather definitely slows it down. Anyone know the temp Tomatoes go dormant? Or do they not go dormant? Optimal temps would be around 75. Belwo 50 they start to slow way down and a frost will kill them. Above 90 and they won't flower or produce new tomatoes.